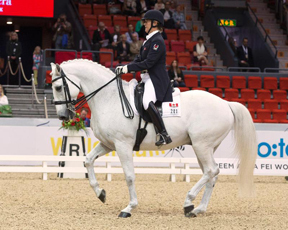 Canadians Jacqueline Brooks and Jaimey Irwin battled it out against the best dressage athletes from around the world, vying to be counted among the finest in their field at the Reem Acra FEI World Cup Dressage Final, held April 24-28 in Gothenburg, SWE. The 2012 Olympic duo, Brooks of Cedar Valley, ON, and D Niro, Brookhaven Dressage Inc.’s 14-year-old Swedish Warmblood gelding sired by D-Day, earned one of the highly coveted spots in the renowned Grand Prix Freestyle, having qualified on a score of 67.356% in the Grand Prix two days earlier. Rested and eager, Brooks anticipated nerves from D Niro in the Final, but was very pleased with the performance, receiving a final score of 68.661% to earn a final ranking of 14th in the world. “D-Niro and I have had an amazing time here at the World Cup,” said Brooks. “It is by far the most electric arena he has ever experienced; he was a true and honest partner. The Grand Prix was probably the best feeling test of my career. Making his debut in the Grand Prix Freestyle, Irwin of Stouffville, ON, riding Lindor’s Finest, Sylvia Carlton and Ute Busse’s 16-year-old Canadian Warmblood stallion sired by Eastern Ruler, was first into the ring for the ultimate test, finishing on a final score of 66.643% for a 16th place ranking overall. The Ground Jury for the World Cup Final was made up of Elizabeth McMullen (CAN), Maria Colliander (FIN), Andrew Gardner (GBR), Gustaf Svalling (SWE), Gotthilf Riexinger (GER), Jean-Michel Roudier (FRA), and Wojtek Markowski (POL).